Koi Fusion is a food truck in Portland that serves up innovation Korean BBQ and Mexican fusion cuisine. They sell items like tacos, burritos, sliders, and rice bowls, and they let you choose what type of meat you want. They have a couple of locations (both trucks and a new permanent one) and they are frequently visiting different areas, so it is best to check their schedule online. My family visited the location at the Mississippi Marketplace. I thought the Mississippi Marketplace was a cool location. There are several other trucks in the same area and they have covered outdoor seating where you can eat. It would be a good place to come with a group of people because there are so many food options. 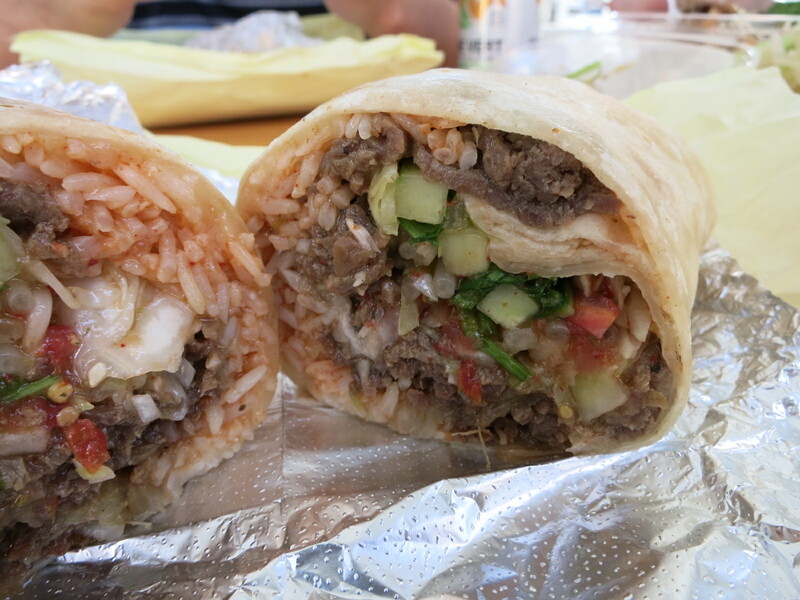 The burritos ($7.50) are filled with your choice of meat, kimchi fried rice, mozza cheese, fresh local vegetables, and your choice of spicy or mild salsa. I chose the bulgogi beef for my meat, because the lady working there recommended it. The beef was tender and very flavourful. It had a slightly sweet flavour similar to a teriyaki sauce. The rice inside of the burrito was moist and all of the vegetables added a fresh crunch. The spicy salsa was also tasty. It wasn’t a burn your mouth spicy, but it left a little tingle on your tongue after you finished. Although this burrito was big and very filling, it didn’t leave you feeling too heavy, like more traditional Mexican burritos do. The Koi rice bowls ($7.50) are made with kimchi fried rice and topped with fresh vegetables, Korean salsa, and your choice of meat. This is basically a deconstructed version of the burrito sans tortilla. This bowl was also very tasty and it hit all of the same flavour notes as the burrito. This is a good option if you want something less messy and more portable. I enjoyed the food from Koi Fusion. It was interesting, fresh, affordable, and filling. Korean and Mexican fusion seems to be popping up everywhere, but I’m okay with that, because I think the two styles work well together. This is a place I would come back to and I wouldn’t mind trying some of the other meat options. Yes, for fresh food and interesting Korean/Mexican fusion.